The Flashpoint Shooting Table with Plexi Glass is a classic transi-table that streamlines the photography for still-life products that require glossy white background without the tone of paper surfaces and matte, for the ultimate way to shoot crystal, glassware and other transparent or translucent objects. The 24 x 40" Plexiglas sheet can be under lit to eliminate shadows, backlit to give the illusion of spotlighting, or heavily top litto satisfy drop shadow effects without post production. The cleverly designed aluminum frame raised the plexi 20" off the ground andforms a gentle curved slope behind the flat table top. The illusion of a continuous, seamless is easy to achieve, with the creative option to light tone gradations as an option. 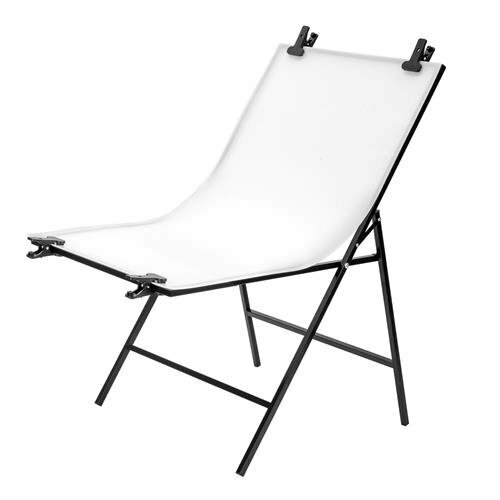 The flexible table is the best investment that a studio can make when serving to photograph ecommerce, metallic objects and beverages, as well. The table folds opens like a folding chair - flat for storage and transportation. 6 clamps grasp the plastic to the frame according to the tension you desire. Clamps secure the surface at the tension you prefer. If you have any questions about this product by Flashpoint, contact us by completing and submitting the form below. If you are looking for a specif part number, please include it with your message.